I'm beginning to wonder if we qualify as homeschoolers anymore, since we are rarely at home - or so it seems. Amber and I had quite a busy week full of social events and learning experiences. She actually earned nearly a full week's worth of hours, except very few were in the core subjects. Oddly, I'm mostly ok with that, at least on occasion. It demonstrates to Amber that not all valuable learning comes from books or is in the few core subjects. 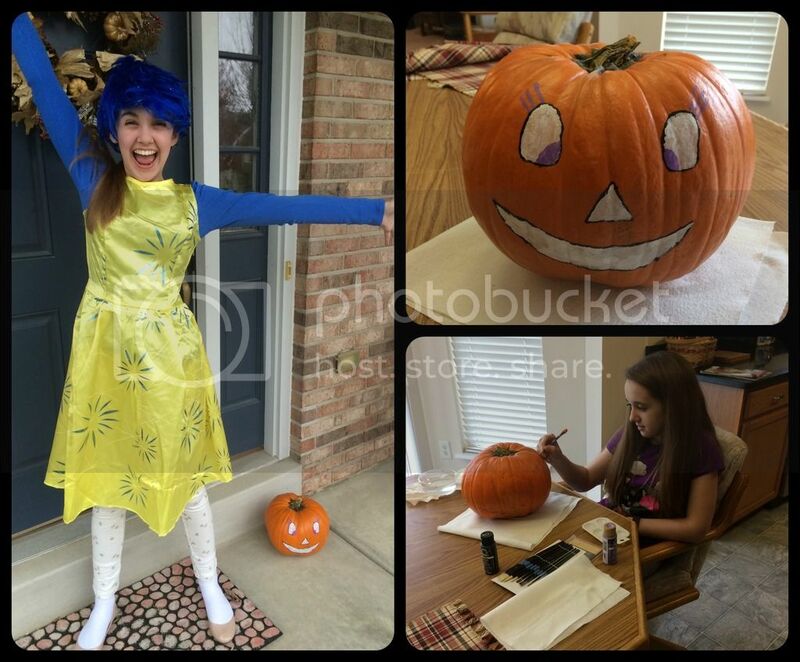 Joy (aka Amber) and her first painted pumpkin. We ran out of time to carve. Halloween party and trick-or-treating with friends. This was the first time she didn't trick-or-treat at home and her first time being part of a themed group. Amber was Joy from the movie Inside Out. Her friends were Disgust and Sadness. They were the cutest group of emotions. Sausage Supper Serving - It was our first time attending and serving at an sausage supper. We didn't actually eat there, since I have issues with sausage. Amber and a friend served a 2.5 - 3 hour shift in the dining area by clearing tables, refilling drinks and assisting guests. I worked with the desserts. We both shopped a little bit at the silent auction. Fred bravely returned for his exhausted people at the end of our shifts. Physical Therapy - They are still taping Amber's knees each week but have added chest support for her very loose ribs. It worked, but Amber can only tolerate the rib taping for about 2 days. Flute Lesson - Amber is still preparing for an upcoming performance. Art Class - Only one more lesson left in this session. I'm not sure if she will sign up for more immediately or take a break until after the holidays and her next confirmation module. CPR & First Aid Certification - Amber, one of her friends, and I took a CPR and First Aid certification class through our homeschool group. It was more of a refresher for me, but it was the first time the girls had been exposed to the training. We all passed and are now certified, including infants, for two years. Homeschool Co-op Classes - Greek and Roman Technology, Play-Do Economics, Embroidery, and Knitting. We only have four more weeks of this semester, which is hard to believe. Amber loves all of her classes, but it is looking more like she will end up dropping two of her current classes in favor of yearbook and an improv drama class. She may also have a free hour for study time if additional classes that hour aren't added. Who knows? We will make decisions when the schedule is published. It's great to have so many choices though! 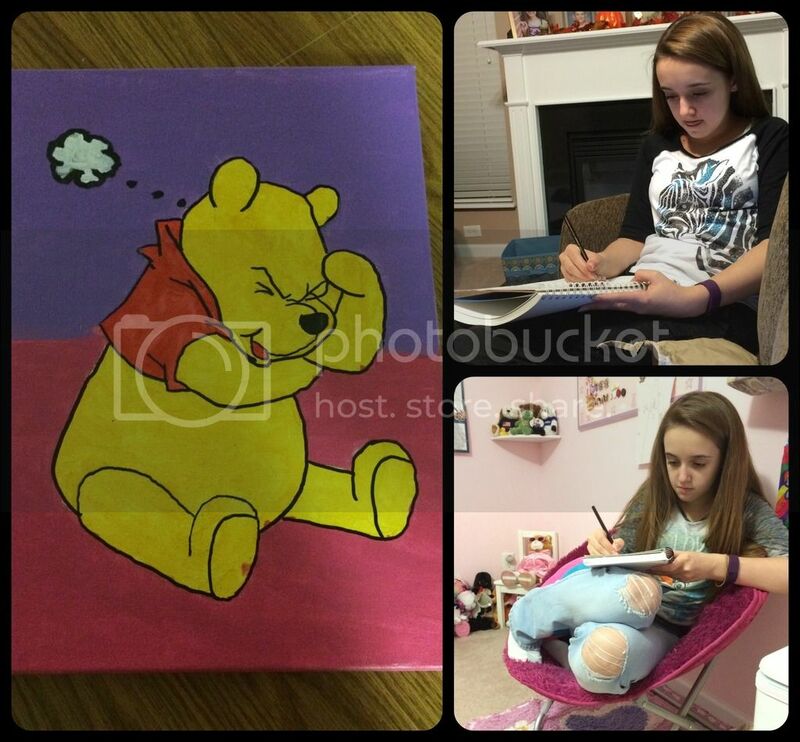 Canvas painted Pooh Bear from art class, plus sketching. Additionally, Amber spent many hours working on her embroidery project for her co-op embroidery classes. She is nearly finished with the first project now and is looking for her next class project. Amber also spent much of her free time drawing and doodling in her sketch books. It makes my heart happy to see her enjoy art so freely. She's also begun working on Christmas presents for family members - well working on one project and ideas for the others. For book work we completed quite a few Bible studies, but again these are not considered core subjects. Amber is truly enjoying a new Bible study we've been using (a review is coming up on Tuesday) and she asks to do more each day. I can't argue with that. 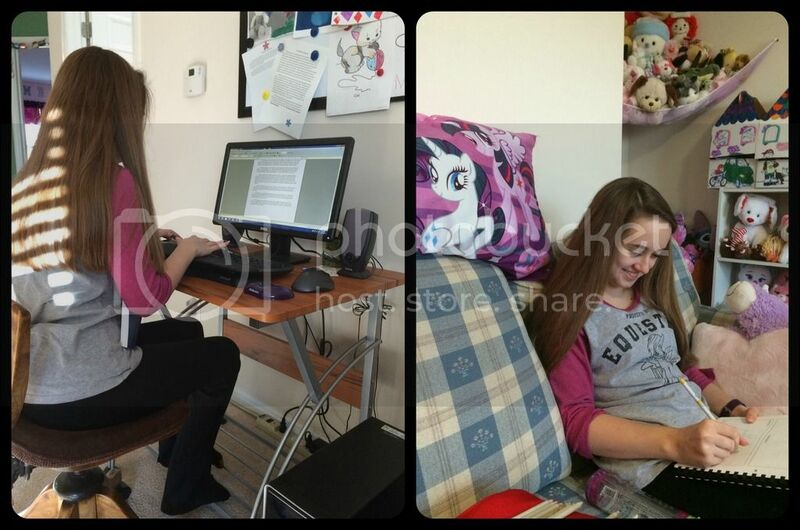 In the core subjects, Amber worked on one writing lesson, three math lessons, and one history lesson. A paltry list indeed, yet so much other learning happened this week. Of course, she did plenty of free time reading that we don't even bother to log as part of our school hours. Actual school work - writing and Bible study. This has also been a week of discussions. Amber and I talked several times about her goals for the future. She is a quiet planner and thinker, and has been ever so carefully refining her thoughts on future educational goals. She still wants to pursue a degree in English, specifically with the goal of becoming a writer. She also believes she'd like to minor in music, but this is still a thought in progress. Amber is really just beginning to understand that she has so many options open to her and that a degree in one field doesn't always mean you are strictly limited to that area for your entire life. There are also many ways to utilize a single degree. 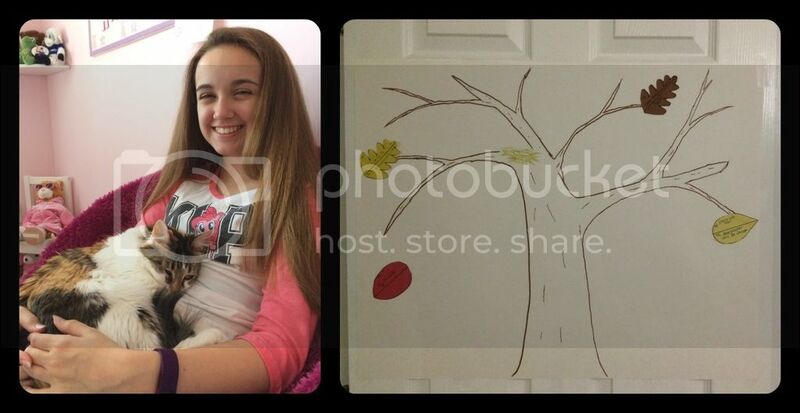 A cuddly kitty makes for a happy girl, and our Thankfulness Tree has returned again this year. For much of Amber's life she expected to follow a similar path as both of her parents by entering a STEM field. Of course, she didn't know the term STEM when she was younger, but still anticipated being a science type person. As she entered middle school, Amber was feeling less interested in STEM topics yet felt it was somewhat expected of her to be a science person anyway. She has felt such relief and freedom knowing we don't expect this of her and that she honestly can choose whatever she wants for her future. Hopefully, she continues to explore all the options open to her and not feel the need to fully commit to any future yet. This looks to be a restful weekend and then next week we have mostly normal days where we should be able to keep to our planned school schedule. I'm unrealistic in my optimism on this matter and next week will be laughing at myself, however as of today I'm determined we will be diligent in sticking to our schedule for at least one week. Go ahead, laugh now if you like. I'll give you a second. Being in Missouri with you, I get the whole "hours" and "core subjects" thing. This week was our first week in four that we actually HOMEschooled! We have had so many experiences and field trips lately. I do think it's the time of year. Things always seem to settle down from now until Spring. It did sure feel nice to stay home this week and do some of those core subjects!! Enjoy your down week next week! I sometimes think we are carschoolers. I am not sure that is a word, but you get my meaning. I love all that you guys did this week. What wonderful learning experiences. It sounds like you guys are becoming a bit uschoolish to me!! I think it's great that you have let Amber know she needn't feel obligated to follow in her parents' science career footsteps. We have one son who we thought wanted to get a certain degree and so we kind of pushed him along that path. Trouble is, he didn't really want that for his life, but never told us. He was quite miserable for a while, which might have been avoided if we had all just communicated better! You guys have a great new week coming up!! Jo, I'm sure the girls would have fun mailing each other. It's a great idea. And thanks for the support. Sometimes I feel like we are just winging it.